At the farmer’s market on Sunday, in a momentary lapse of judgement, I found myself buying a whole 2 1/2 pound striped bass. What was I thinking? I have never prepared a whole fish before! Well, Good Mother Diet is partly about expanding my culinary repertoire, so here goes… This recipe can also be adapted for cooking individual fish filets (see recipe for tips). Chimichurri, a sauce which is a staple on Argentinian tables, is made from finely chopped parsley, minced garlic, olive oil, oregano, and white or red wine vinegar, although there are many variations which include cumin and other spices). 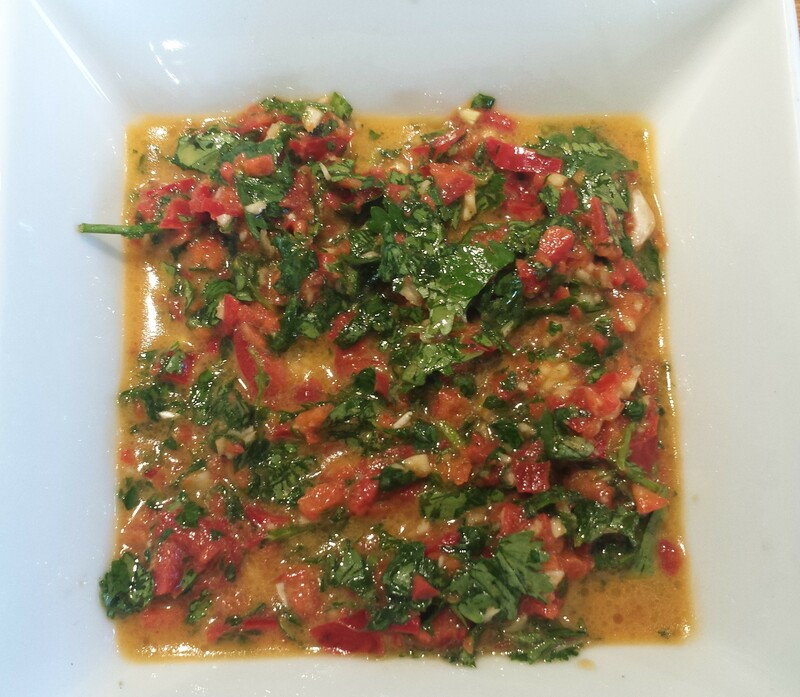 Since striped bass has such a nice delicate flavor, I didn’t want to overpower it with too many strong flavors during cooking, so topping it with a spoon of chimichurri sauce after cooking is a great way to add freshness and flavor without ‘drowning’ the fish. 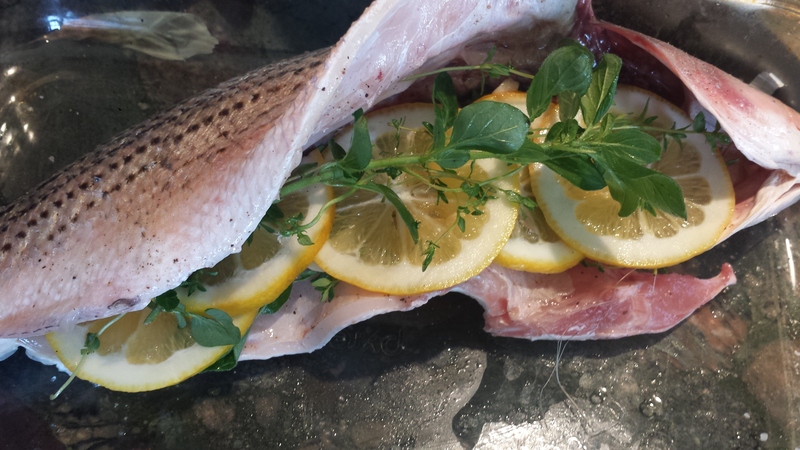 Cooking whole fish seems daunting but in reality, the preparation is quick and easy. The only challenging part is removing the bones which can be done before or after cooking. Most butchers (even at farmers markets) will gut, clean and scale the fish for you even removing the fins. If you ask, they might be willing to also butterfly and remove the bones so you don’t have to do it later. If you are preparing smaller fish that hasn’t been de-boned you can leave it up to each diner to remove the bones, however, if you are cooking a large fish and serving family style, it’s best to remove the bones and cutting the filets into smaller pieces for serving. 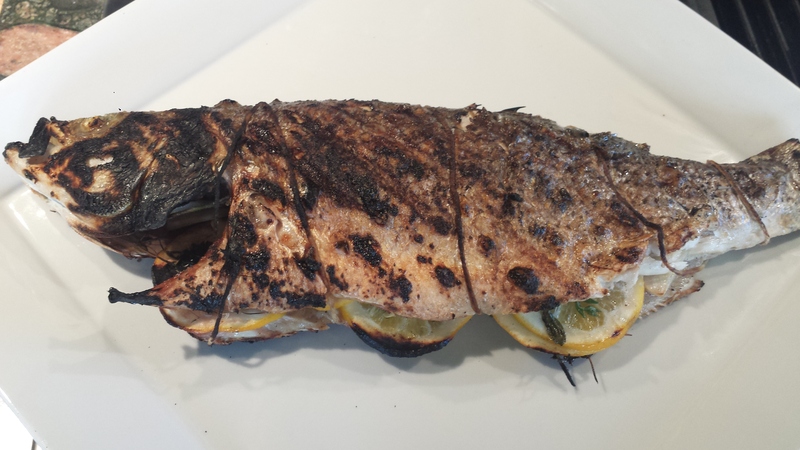 Click HERE for video instructions on how to debone a cooked fish. Rinse and dry the fish with papertowels. Brush the inside of the fish with olive oil and sprinkle with salt and pepper. Spread half the thyme and oregano sprigs inside the fish. 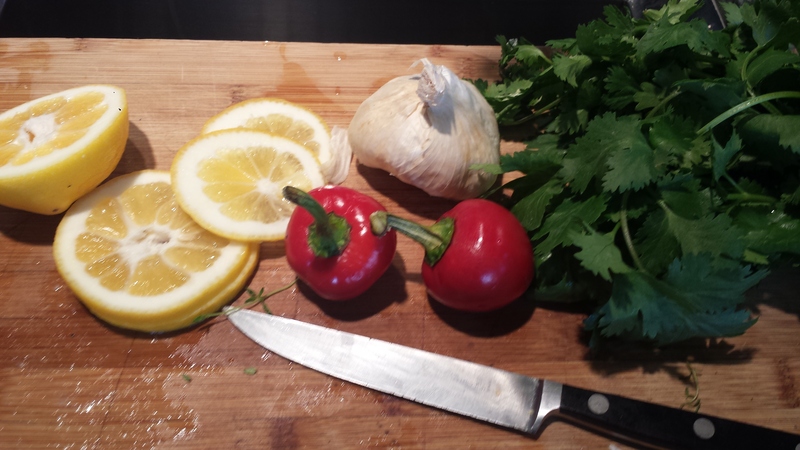 Arrange the lemon slices on top of the herbs and place the rest of the herbs on top of the lemon. Wrap the twine, if you are using, around one end of the fish and tie it in place. 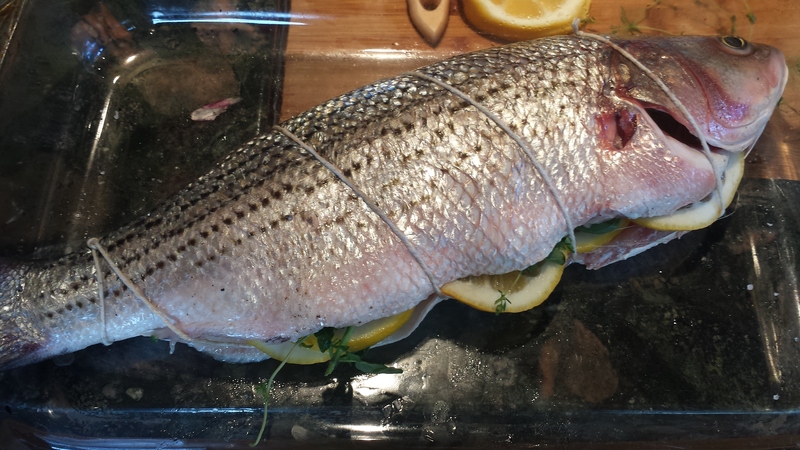 Wrap it around the fish several times, to keep the filling inside, and tie the other end. Preheat grill (or broiler). Cook fish for 5 minutes. Carefully turn it over and cook another 5 minutes, or until fish flakes easily. If you are using filets instead of whole fish, brush both sides with olive oil and sprinkle with salt and pepper. Broil 3-4 minutes on a rack at least 6 to 8 inches away from heat. 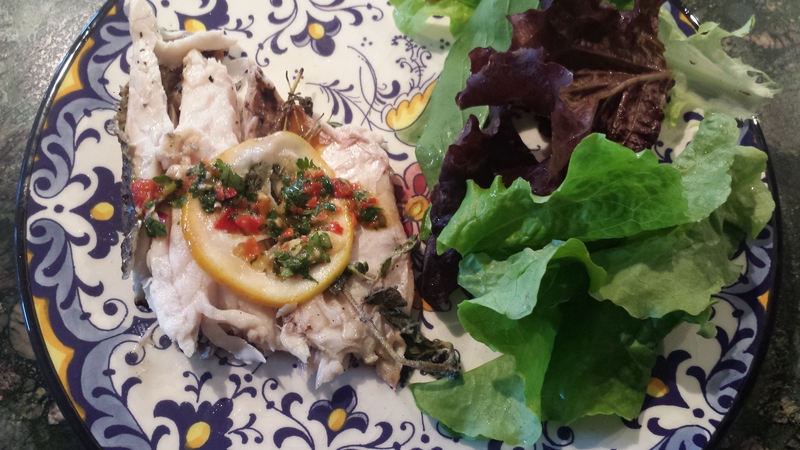 Turn fish over and place herbs and lemon on top. Broil 3-4 more minutes. Top with Chimichurri Sauce. You can choose to serve the fish skin side up or down depending on preference. Combine all ingredients together and spoon over cooked fish. 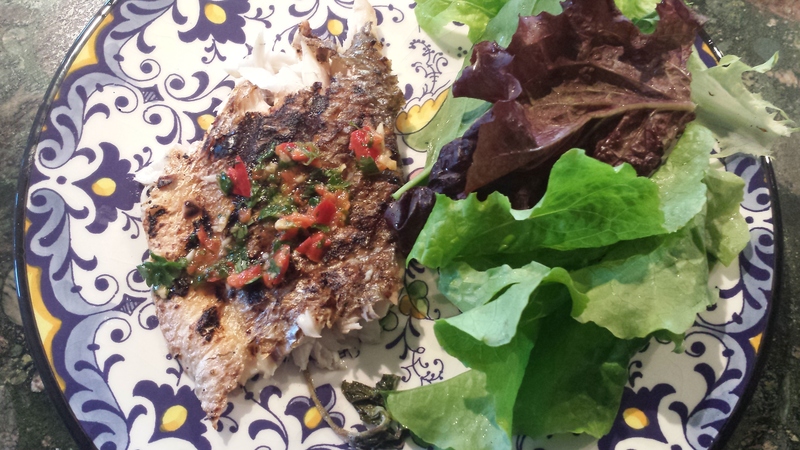 This entry was posted in All Recipes, Pescetarian, Wheatless Wednesday and tagged Argentinian sauce, chimichurri sauce, gluten free, grilled striped bass, grilled whole fish, grilled whole striped bass, Pescetarian, Wheat Free. Bookmark the permalink.